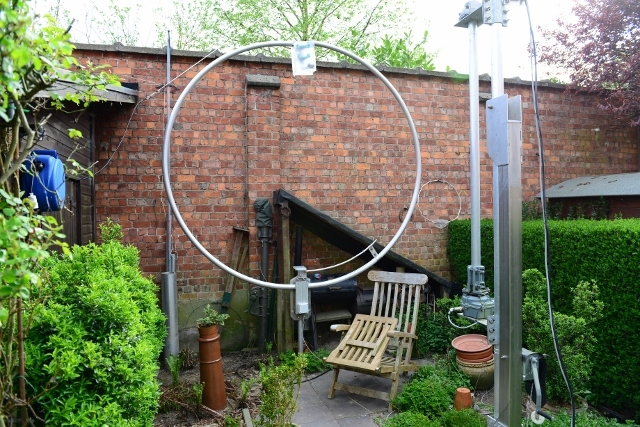 Tuning a magnetic loop antenna takes some time. First of all you have to set the gamma match around the middle position between the feedpoint and the end of the gamma match. Then set the capacitor for minimum SWR in the center of the desired band. This must be done in very small steps because of the narrow bandwidth. The best and fastest way is to use an antenna analyzer. In my case I use a miniVNA PRO or the RigExpert AA-600. Once the antenna is set to minimum SWR you need to tune the gamma match for the location of the antenna. This must be done by shifting the gamma match bridge in very small steps, to or away from the coax connector. For fine tuning use steps of 1 mm or less. It's possible to archive the perfect tuning as you see in the following graphics from the 40 m band. Fine tuning with MiniVna Pro direct on the antenna, 4.5 m above ground and Bluetooth connection. Even in this position, 90 cm above ground and 90 cm from the wall. It's perfect to tune on 80 m band with the given dimensions of the gamma match. But with a significant loss of efficiency. Overlay: Worked stations during a few months of experiments on 80 m in phone. Antenna 1.2 meter above ground level and 5 m. away from the nearest wall.